Having travelled around India exclusively over the winter for the past five years, we had to turn our attention to the summer destinations for the fear of not disturbing the delicate Cosmic Balance. After pouring over the climate data for the last century and a half, I made a grand prediction that Ladakh during the third week in June would be the perfect holiday. When our plane dropped us in Leh under a spotless blue sky, the swagger in my walk had reached Jack Sparrow-esque proportions. I soon discovered the swagger was more due to the altitude (Leh being at 3500 m above sea level) than vanity and we soon found ourselves dozing on the comfortable hotel beds. 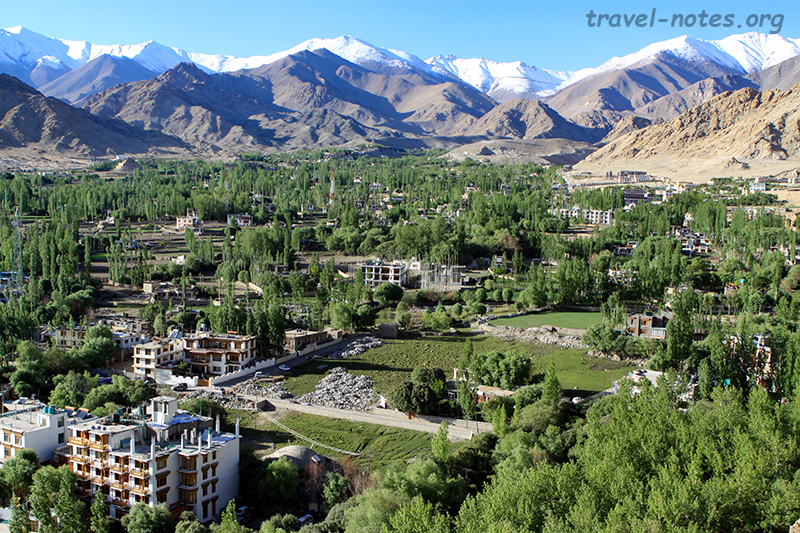 The bright blue skies eventually did manage to drag us out of our slumber and we staggered up to the Leh Palace to enjoy wonderful views of the city back-dropped by the majestic Stok range. My meticulous weather predictions turned out to be as laughably inaccurate as IMD’s as grey skies greeted us the following morning. Apparently, someone has been heating up the Indian Ocean over the summer causing a dipole and the resulting turbo charged monsoon reached Kashmir faster than our Himsagar Express. I thought Modi’s election promise was High Speed Trains and not High Speed Rains. The plan for the day was to drive as far west as humanely possible checking out the various monasteries en-route. Our first stop was Lamayuru – at 120 km west of Leh, this is the furthest you can get in a day trip. 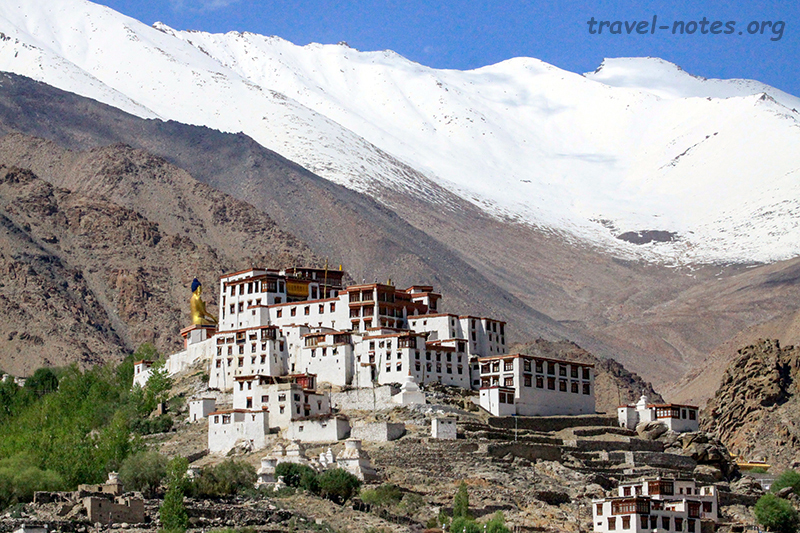 The picture perfect hilltop monastery gave us sweeping views across the valleys on both sides. After a quick lunch and a quicker in and out of the monastery we headed to Alchi, on the route back to Leh. The millennia old Alchi group of temples is the only religious monument in this region not offering a dramatic photo-op, but they more than compensate the loss by some spell-binding gigantic statues on the inside. Likir, 15th century monastery photogenically placed between fields and snowcapped peaks, Basgo, dramatically perched up a hill, and Spituk overlooking the city of Leh rounded off the day. The next morning we crossed the Khardung-La (5,359 m or 17,582 ft), widely and wrongly believed to be the highest motorable pass in the world. After gritting through the monsoon induced snowfall and the altitude induced nausea on the top, we regained our composure when we reached more humane 10,000 ft average elevation of the Nubra Valley on the other side. We continued on along the Nubra River enjoying the vistas of the wide valleys and the snowy peaks until we reached Panamik, the furthest you can go before being shot at by the army. We then headed back to spend the night at Hunder. Hunder is famous for its powder fine sand dunes and the two humped Bactrian Camels to ride on them. The camels are relic from the old silk trade days when the overland route to the Central Asian plains didn’t have to cross a hostile neighbour. Since the scar of riding the one humped variety in Jaisalmer had not quite yet healed, we settled for just photographing the beasts from far. The following morning, we took the only other road available in the valley, the one along the Shyok River to Turtuk. The sun and the clouds played hide and seek all day, but the Shyok has done a much more commendable job of chiseling the landscape than the Nubra that the “seek” bit more than made up for whatever was “hid” from us. The route has more dramatic twists and turns than the entire Poirot series allowing one to easily miss another fascinating twist happening in more human scale – the culture suddenly jumping from Buddhist Ladakhi to Islamic Balti as one approaches Turtuk. The Islamic bit did belong to Pakistan up until the war of 1971. Beyond Turtuk lies Siachen, the uber high altitude glacier where had we sent our prisoners instead of our bravest soldiers, it would have been considered most cruel and unusual punishment. The following morning, we stopped by the Diskit monastery, another Tibetian box construction precariously placed on an impossible slope. Paying the customary homage to the gigantic 32 m tall Maitreya Buddha statue and huffing and puffing up and down the monastery, we started on our ascent to Khardung-La. At around the point where I fully expected me to break, our taxi did. The worried look on the driver’s face changed to a hopeful smile when Aparna blurted out that I am a Mechanical Engineer from IIT, Madras. With an inability to tell the boot from the bonnet, a complete face loss was on the cards. I tried to salvage the situation by explaining why the Carnot Cycle has to be a rectangle on a T-S graph, the only knowledge of any relevance that I was taught. Since nothing was getting salvaged, I quickly flagged down the next taxi, pulled Aparna in and headed to Leh leaving the poor driver high and dry (rather high and wet as it had started snowing by now) with an useless graph and the mighty Khardung-La ahead of him. Looks like the monasteries along the Indus had no effect on my moral character honed by years of cut-throat capitalism. Soothing our conscience (or what is left of it) with the news that the driver (and the car) somehow made it back the previous night, we headed up the next highest pass, Chang-La (5,360 m or 17,590 ft) to get to an high altitude lake, Pangong. Another 249 tourist vehicles joined us on this daily pilgrimage. The lunacy goes back a few years when Aamir Khan decided to use this lake as the backdrop of the climax (which did not require a lake) for his movie 3 Idiots (which did not require a climax). Ever since then, hordes of tourist climb up and down the Chang-La every single day just to get the chance to stand on the very ground that Kareena once did. With the monsoon in its peak glory and the tourists in their peak madness, the inevitable did happen – a total gridlock at the pass. After cooling (rather, frosting) our heels till noon, it finally dawned on the day trippers they cannot make it to the lake and back by midnight. As the day trippers slowly started U turning one by one, the rest of us could inch forward towards the lake. It was just the fear of having to cross Chang-La twice in the same day and no great foresight that made me book an accommodation at the lake. As we finally pulled into our night stop, four hours past schedule, the weather finally began to clear and we ended up enjoying the most glorious sunset of our lives thus far. After spending the night tossing and turning (thanks to the 14,000 ft altitude) in our beds, we got up to witness a spotless blue sky when the lake puts up its famous “Fifty Shades of Blue” show. Apparently, the turbo charging of the monsoon was not due to the IOD, but due to some madman swinging with Julian and hence, July (my original planned month before I started dabbling in weather soothsaying) is going to be bone dry. We made the best of the good weather and ogled at the lake to our heart’s content before heading back to Leh. 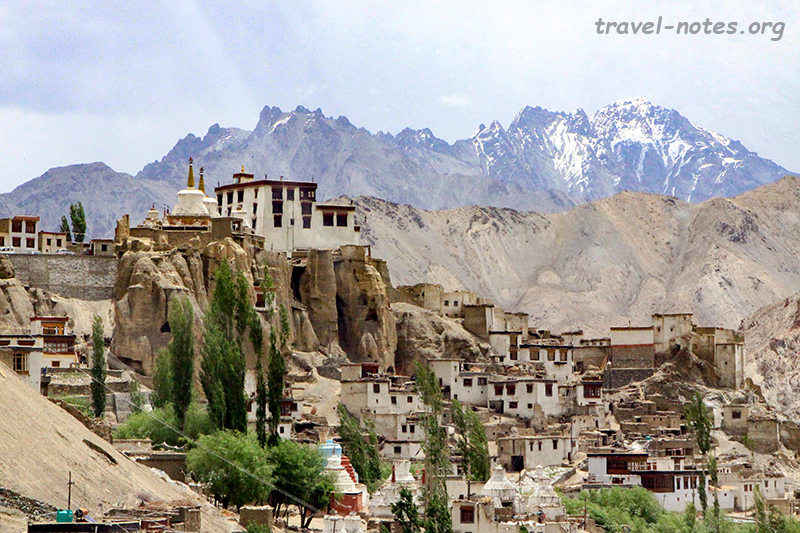 On the way back, we stopped at Thikse, the biggest of Ladakh’s monasteries. Coming face to face with the resident 14 m high Maitreya Buddha was truly a heart stopping moment. 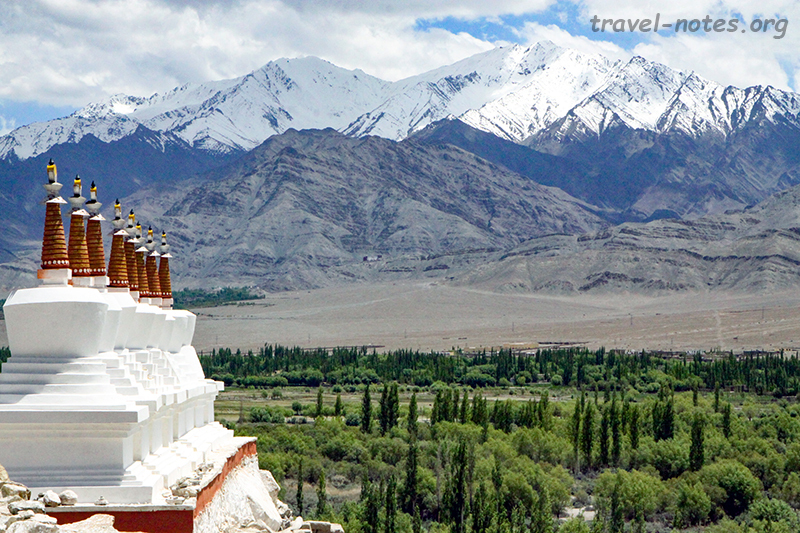 Post a quick in and out of the Shey Palace, home to a 7.5 m tall Buddha statue and the ex-home of the Ladakhi royalty, we reached Leh for a well-earned night long deep meditation. Since there is no such thing as too many monasteries – a belief widely held just by me – I dragged my wife along to visit yet more of them on the final day of our trip. We started off with the Stok Palace, the current residence of the Ladakh royalty and thanks to that fact, it had some semblance of opulence unlike Shey and Leh Palaces. It was yet another picturesque building despite the ugly TV tower that Prasar Bharati, in its infinite wisdom, had decided to plonk right behind it. The next stops were the Matho and Stakna monasteries which are tourist starved enough for the resident monks to take interests in the occasional strollers and award them with a personal tour. We finally headed to Hemis, the most important of all Ladakhi monasteries. Our reason to get this far is to stare back at the 8 m tall “staring into the void” Padmasambhava statue and to ramble through its famous museum. What we did not know expect is to stumble right into the middle of the annual three day Tse-Chu festival. Watching the exotic Cham Dance and getting to partake in one of the quaintest festivals of the world was a wonderful way to end this journey. 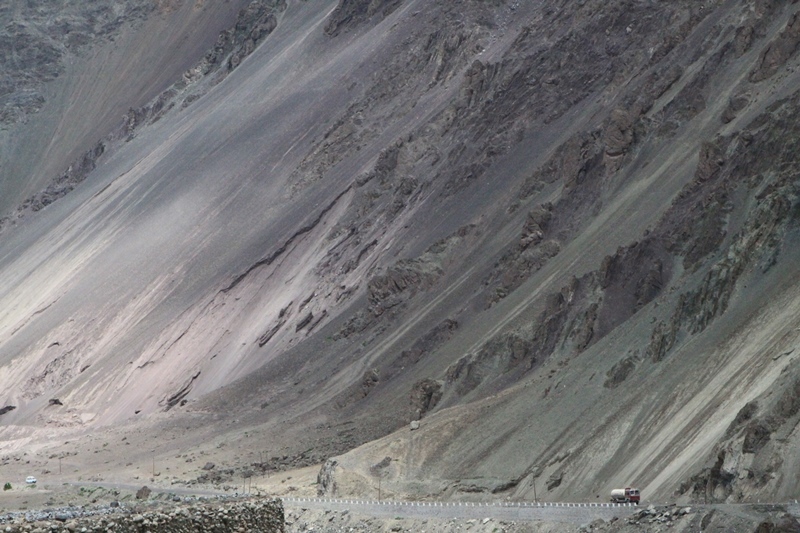 Click here for more photos from Leh and Leh-Kargil Highway. 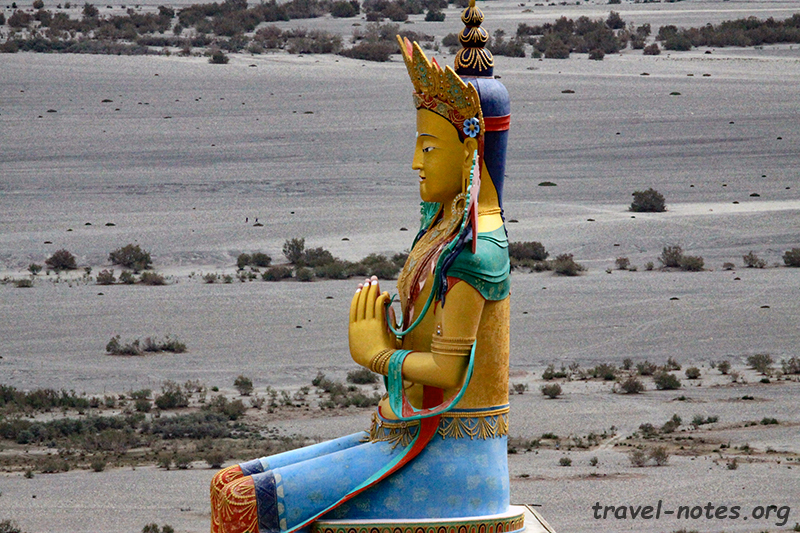 Click here for more photos from the monasteries to the east of Leh. Click here for more photos from the Nubra Valley. 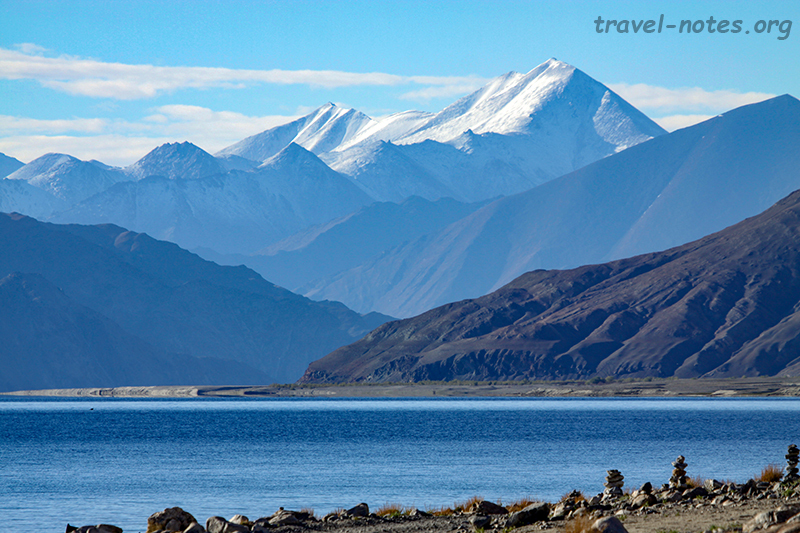 Click here for more photos from Pangong Tso.